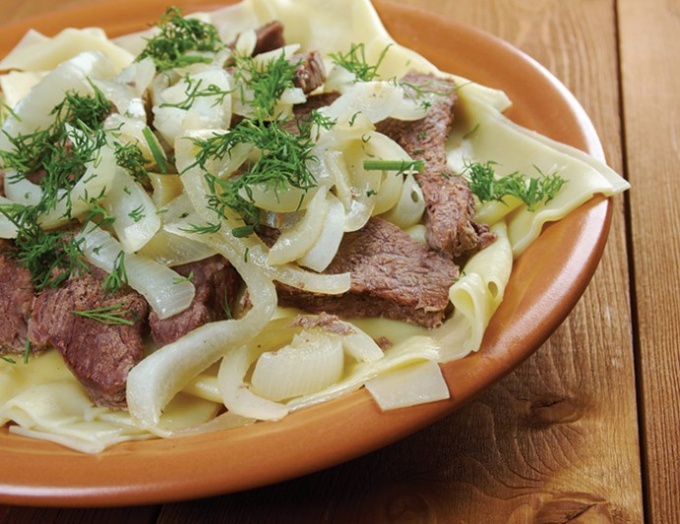 The traditional Kazakh dish beshbarmak is prepared from thin layers of dough, a large amount of onions, herbs and meat. As the last ingredient, usually use lamb or a fat bird. Delicious beshbarmak is obtained from the domestic duck. - black pepper to taste. Duck gut if necessary, thoroughly wash and cut into 4 pieces. Add to a saucepan and cover with water so that it only covered meat. Bring to a boil, remove the foam, reduce the flame and simmer under the lid until the meat is tender and will not be well separated from the bones. At the end add salt and pepper to taste. When the duck is ready, take it out, cool slightly and separate the meat from the bones. Onions cut into half rings and pour a small amount of broth to get rid of bitterness. In the remaining broth, boil the cakes, and then place them on a large flat dish. Put the slices of meat, steamed onions in the broth and sprinkle all with herbs. To save time and effort, you can use ready-made cakes for beshbarmak, which are sold in the store.